The Weeklings are comprised of Glen Burtnik aka "Lefty Weekling" (bass and vocals), Bob Burger aka "Zeek Weekling" (rhythm guitar and vocals), John Merjave aka "Rocky Weekling" (lead guitar and vocals) and Joe Bellia aka “Smokestack Weekling" (drums and vocals). 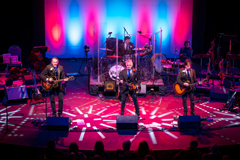 The Weeklings bring The Beatles to life, not through costumes and gimmicks, but through their extraordinary musicianship, exceptional vocals and charming stage presence. They are annually featured at premier Beatles festival events like Abbey Road on The River and The Fest for Beatles Fans. You can hear The Weeklings on Sirius XM’s The Beatles Channel and Little Steven’s Underground Garage, where they have scored a number of “Coolest Song” designations.